Get a Cineplex 2-for-1 Movie Admission! 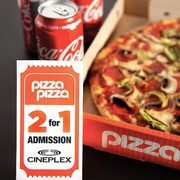 Pizza Pizza Pizza Pizza Dinner + Movie Deal: Get a Cineplex 2-for-1 Movie Admission with Select Pizza Meals Get a Cineplex 2-for-1 Movie Admission! Show your Valentine the true meaning of love by treating them to a romantic dinner at Pizza Pizza, because their Dinner + Movie deal is back and you can get a Cineplex 2-for-1 movie admission with select pizza meals! There are two eligible meals and we've listed both of them below, along with what they include. The pricing for either meal is a good value, but the bonus 2-for-1 admission makes both offers an especially good deal, as the price for a single Cineplex general admission ticket is regularly $13.99 (pricing will vary by region). This offer is available for a limited time with delivery or in-person orders -- click here to find the Pizza Pizza location nearest you. Thanks OP! Love this combo deal. Based on previous years, coupon is usually valid Sun-Thurs. Do they hang out Movie coupon or coupon is printed in the box? Just want to buy a large pizza for a event on Saturday. Can't confirm but likely similar. If you survive the pizza, enjoy the movie! I wouldn't eat Pizzapizza if they were giving them away...Aside from decent panzos and sandwiches after 1am, they never get my $ for their disgusting pizzas. Crust, sauce, cheese...all terrible and some of the worst out there. Stack this deal with the $50 gift card for $40 from Costco. love their hot sausage! my goto is pineapple,sausage and bacon strips! i think bacon is 2x topping now? Yeah, you choose Ba or Con if you do one topping. thelasthunter wrote: ↑ I wouldn't eat Pizzapizza if they were giving them away...Aside from decent panzos and sandwiches after 1am, they never get my $ for their disgusting pizzas. Crust, sauce, cheese...all terrible and some of the worst out there. My prefer pizzas are Hut > dominos > pizza pizza. These are the three i mainly eat with Hut being most often. Im not a big fan of pizza pizza brand but theyre like the MCD of the world in the GTA. theyre at every plazas and it's convenience. Normally i wouldn't look at them unless theres a decent deal. Also like someone stated above, stack their promos with costco $50 for $40 gc is the only way to go.